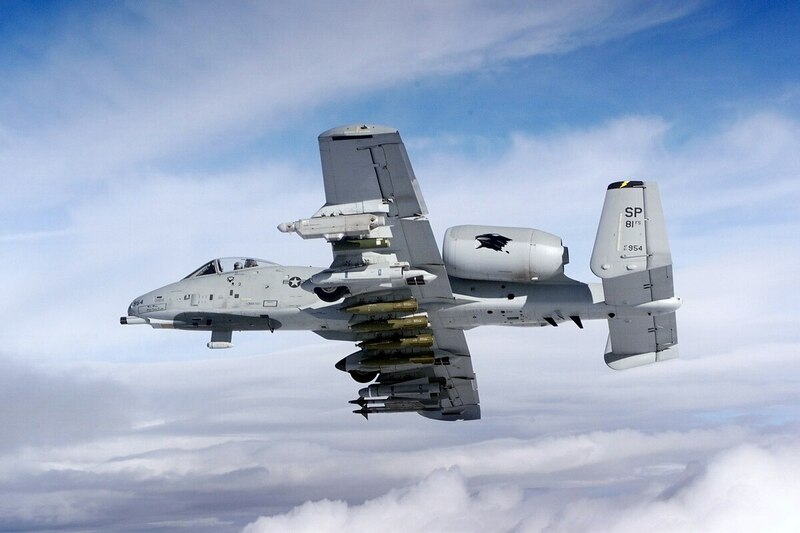 The Air Force is on the attack to eliminate the beloved A-10, insisting that the venerable Warthog is not the only airframe up to the close-air support task. To press the point, service leaders showcased a group of fighter pilots, who described their CAS missions in other aircraft. But opponents on Capitol Hill, and troops on the ground, aren't having it, and the service faces an uphill battle to cut the jet and bring its beleaguered F-35 online in time. It's not that the service's leaders don't like the Warthog; they claim they just can't afford to keep it — and still field the F-35. "All of the information and data that I have seen about the conduct of the last 12-13 years of war … tells me that the A-10 has done a magnificent job, but so has the F-16, and the F-15E; and the B-1 bomber has been a contributor," Air Force Secretary Deborah Lee James told a Senate panel Feb. 25. "And there have been a number of aircraft that have contributed to the totality of close-air support. So, to me, close-air support is not a plane. It's a mission. And it's a sacred mission." Leading the move on the Hill to keep the A-10s is powerful Sen. John McCain, R-Ariz., chairman of the Senate Armed Services Committee. He scoffs at the suggestion that anything else is as capable as the A-10, which he calls the "finest close-air support system in the world." McCain has vowed to block the retirement. "I've yet to meet, a general, an Army commander whose responsibility is with the troops on the ground, that believes a B-1 or an F-16 replaces the capability of the A-10," McCain said. "If you know of someone I'd be glad to meet and talk to them. Those are the ones whose judgment I rely on because they're the ones whose people are in harm's way." In an effort to counter the opposition, the Air Force officials have spoken extensively about the service's plans for future close-air support, and they are working publicly with other services to boost their position. The message is coming from all ranks: We don't want to get rid of the Warthog, but the budget requires that we do. But we will not give up the close-air support mission. The A-10 has unique capabilities that make it a legendary close-air support platform: the ability to fly low and slow over a target, its increased loiter time and the venerable GAU-8 Avenger gun, capable of firing up to 1,350 .30mm armor-piercing rounds. Proponents say this makes the aircraft irreplaceable in the current close-air support flight. And, the F-35 won't be CAS capable until 2023. This is the second consecutive year the Air Force has tried to get rid of its 283 A-10s, a move officials say could save more than $4 billion over five years. Last year's effort was blocked by Congress, and in attempting to make the move this year, the service is talking more, and showing more frustration to its critics. "There is this thread of conversation going on that has become a little ridiculous, that the Air Force isn't committed to close-air support," Air Force Chief of Staff Gen. Mark Welsh said in early February. "Well, I've got 140,000 data points over the last seven years that prove this is a ridiculous statement. That's how many CAS sorties we've flown. That's about 20,000 per year. When is the credit going to be given for that?" At every step of the way, however, lawmakers have reiterated their plans to block the cuts. And supporters of the A-10 are growing louder — among them Army ground commanders who spoke to Air Force Times and the Tactical Air Control Party Association, which represents the largest group of current and retired Air Force tactical air control party airmen, the enlisted specialists who call in airstrikes while embedded with ground troops. In November, as Congress finalized the fiscal 2015 defense authorization bill to block the first attempt to retire the aircraft, the TACP Association joined the fight to keep the plane. It sent letters to Defense Department and Air Force leaders urging them to reverse the call to get rid of the Warthog. Despite the other aircraft flying CAS missions, the A-10 is integral to the safety of troops on the ground, the group said. Every member at a TACP Association conference last year agreed that the A-10 needed to keep flying. "This is the first time we've spoken publicly about this issue," said retired Master Sgt. Charlie Keebaugh, president of the TACP Association. "We are compelled to take action at this point. Knowing the status of the world and our brothers, and our friends who are being sent downrange, they deserve to have the support that they need to do the mission." The Air Force leadership is out of touch of what is really needed in the fight, if they are still pushing to get rid of the service's most famous close-air support platform, Keebaugh said. "The people who are saying this have never been shot at, have never been on a battlefield and had to employ that asset," he said. Nevertheless, the Air Force is not looking back. It plans to set up new squadrons of F-15Es and F-16s with a specific focus on close-air support for ground troops. Gen. Hawk Carlisle, head of Air Combat Command, briefed reporters on the plan March 6, following a week-long Pentagon summit of top Air Force, Army, Marine Corps and Navy leaders on the future of the close-air support. "We will always do close-air support," Carlisle said. "We have always been committed to it." A-10 pilots train extensively on close-air support and work with joint terminal attack controllers, who direct combat aircraft involved in close-air support. The service needs to work to "maintain the culture," Carlisle said. "We want to take those aviators, and have designated, predominantly close-air support squadrons in F-15s and F-16s," Carlisle said. The knowledge base is already moving to other aircraft, Carlisle said. So far, one-third of F-35 pilots at Nellis Air Force Base, Nevada, came from the A-10. There is no timeline for squadrons, but it is one of several steps that Air Combat Command is tasked with following the summit, which focused on how the mission will evolve if the Air Force is allowed to retire the A-10 and how capability gaps will be addressed in future conflicts. The command will set up a "close-air support integration group" to focus on training and integration with other services. The group, expected to form at Nellis, will include aircraft, possibly 12 F-16s, and representatives from special operations, the Army and Marine Corps, to operate together with "the intent on continuing to get better at the close-air support mission set." One shortfall that the service needs to address is the undermanned and stressed career field of tactical air control party airmen. The service does not have enough airmen certified as joint terminal attack controllers, and with the high deploy-dwell ratio, "it's hard to get the right training," Carlisle said. To address this, the service is exploring using contracted pilots to train with joint terminal attack controllers to keep them certified and current. The service could also use contractor aircraft, but Air Force pilots, to help both aviators and ground airmen stay trained. The summit included Army Chief of Staff Gen. Ray Odierno, Marine Corps Commandant Gen. Joseph Dunford, Navy staff director Vice Adm. Scott Swift, and Gen. Frank Grass, the head of the National Guard Bureau. Air Force leaders repeatedly said the meeting had been in planning for a while and does not directly relate to the pressure the service faces from congressional leadership about the push to retire the A-10. The Air Force wants to keep flying the Warthog as long as it can, as long as it has the funding, but the service will need to move on, Carlisle said. "There's only so much you can get out of that airplane," Carlisle said.